What do You Google? And Why? Thinking about Life Before Cell Phones used to give me a headache. But now it’s Google, the Internet search engine for quick easy retrieval of information, that I cannot imagine living without. Vital information. Like, how to take grease stains out of grout. Like, what do screech owls sound like? Like, what is chermoula and how do you make it without cilantro? Before Google, I would wonder about something, and maybe try to search for an answer in the library. Most of the time I simply accepted that the world was full of puzzles I’d never solve. There were too many questions one couldn’t ever hope to answer, even with the help of the sharpest librarian. Like, what ever happened to Mark Newhouse, my first boyfriend? There are things I search for regularly on Google. Like synonyms, and chili recipes. And I google my own name periodically to see what others, who might be googling me, can see. A few times a year I google, Where is Marika Warden? My 20-year-old daughter who died 6 ½ years ago. You wouldn’t think anything could change about her. But every time I search, Google yields different information. Last week, in addition to the regular old obituaries, Google listed a White Pages link for her. When I clicked on it I learned that Marika J Warden, age 27, “Lives” in Ithaca, NY. It noted there were 13 marriage records, 2 divorce records, 1 birth and 1 death record affiliated with her name. It cheered me. Like she’s still somewhere in town, still trying for some Guinness World Record. You can ask Google anything. Anything! Like, do cats grieve? I did not pose this question. 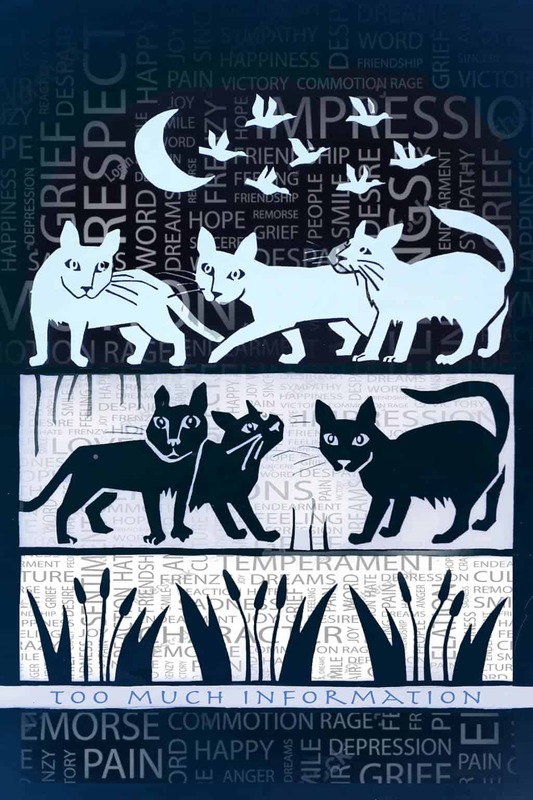 I merely googled ‘grief’ and ‘cats’ to link these two ideas together so I could paste this kitty illustration I designed long ago for Silk Oak (google it) into this blog post. Google instantaneously connected the two, and offered up hundreds of articles on grieving cats. Which led me to wonder, what else could I connect, and why would I even want to connect things like ‘nosebleeds’ and ‘frying pans,’ and what in the world isn’t connected in some way, and why do I feel compelled to keep searching for these things? So, after much consideration, I have an admission: I don’t google to find information. I do it because it feels good to get immediate responses. Lots of responses. It’s like receiving free gifts. And it connects me in odd ways to the rest of the world. Google confirms I am not alone; people from all over the planet are searching. Which led me to the discovery that I’m not the only one addicted to Google. This entry was posted in 2017 and tagged addicted to google, google, googling yourself, instant gratification, instantaneous information, internet search, life after death in cyberspace, searching the web on 2017/10/02 by Robin Botie.